It’s a fact: Mauro Icardi, the joint top goal-scorer of the 2014/2015 edition of Serie A (together with Luca Toni), is struggling to find the net this season. Last season he recorded 0.56 non-penalty goals per 90 minutes, but for the early stages of 2015/2016 his scoring rate has dropped to 0.35 non-penalty goals per 90. His non-blocked conversion rate of 20% has stayed essentially unvaried compared to the 19% observed last season, but his shots numbers have literally nosedived in the 10 games he has played so far. A rate of 3.8 shots per 90 had decreased by 54% this season, to just 1.7 shots p90. Why has this happened? Apparently, the Argentinian himself knows the answer. On the 27th of October, Icardi scored the game-winning goal to enable Inter to beat Bologna 1-0, his third, and so far most recent, of the season. Straight after the game he was interviewed by Sky Sports Italia: “When my team-mates pass me the ball, I can score. Tonight Adem Ljajic assisted my goal, I will take him out for dinner!”. Other than the price of a dinner for two, these words cost Icardi a start; Mancini didn’t like his comments at all and decided to bench Inter’s captain for the following game against Roma. But was Icardi right? After 12 Serie A games, with a slightly bigger sample of games available, I thought that could be interesting to have a look at what the Argentinian said from an analytical point of view. Is he really under-supplied? And if so, by how much in comparison to other Serie A strikers? With these thoughts about Icardi’s situation, I examined Serie A strikers contribution from an slightly less usual point of view. Strikers are often chiefly judged by their overall scoring or shooting contribution, that could be analyzed both from a quantitative and a qualitative perspective. An aspect of a striker’s contribution which is sometimes neglected is their involvement in their team’s plays. For sure there are forwards capable of creating their scoring chance by themselves, but to depend on individual efforts to score goals is not usually a strategy that can be carried out in the long term, especially at the highest level of football. Indeed as a team relies on its striker to finish scoring chances, a striker relies on his team-mates to provide him with those chances; in practice this means it is best if possession can be turned into shots. In this piece I examined different metrics, all based on passes received by strikers. First of all, we need to identify who are the “other Serie A strikers”. Until the 1990’s the striker of a team was identified by the iconic number 9 shirt, but in modern football, it’s rare to see a pure poacher à la Inzaghi on the pitch. Generally, strikers are still the main attacking threat in their teams, but their duties on the pitch are multiple, and not necessarily solely related to scoring goals. Nowadays every striker has to offer a contribution during the defensive phase by pressing the opposition or by tracking back to help their defence in their own half of the pitch. Moreover new roles are withdrawing strikers from their hunting territory, like the notorious false 9 role, fulfilled by Messi under Pep Guardiola, which a variety of managers are trying to employ, even if with results not nearly as good. During the summer transfer window almost every big Italian team acquired at least a no.9, although in the modern meaning of the role: Edin Dzeko moved from Manchester City to AS Roma, while another of the Bosnian’s ex-team-mates, Stevan Jovetic joined Icardi in Milan; the newly appointed Fiorentina manager, Paulo Sousa, explicitly asked the board to purchase Nikola Kalinic from Dnipro; the reigning champions of Juventus and AC Milan decided to double things up by acquiring a pair of strikers each: the Bianconeri brought in Mario Mandzukic and Paulo Dybala (who in Palermo played as the lone striker in Iachini’s 3-5-1-1), while Berlusconi’s team acquired Colombian Carlos Bacca and Brazilian Luiz Adriano. All these newcomers will feature in my analysis, in which I considered the volume of passes received by every forward, who, according to Whoscored, played at least 450 minutes in a central striker position, both as a starter or substitute. Since changes of position occurs often even during the same game, I considered the entire amount of time played by strikers who made the cut¹. This criterion excluded the likes of Alvaro Morata (this season he has a new role wide on the left) and every Lazio’s striker, since not a single Biancoceleste forward made the 450 minutes time cut². 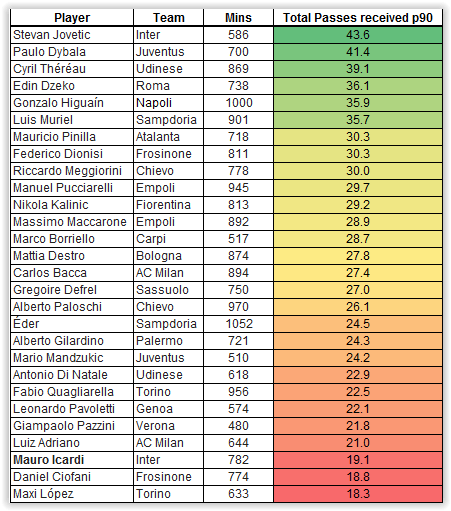 However excluding Pioli’s team, the 28 strikers population listed in the chart below, includes at least a single striker for every Serie A team. 12 games, and especially the first 12 games in a league, is certainly a small sample and so is difficult to play down absolute conclusions but when analysing players and certainly new players in a team, the process starts early on and a coach will be monitoring his players continually in order to maximise his team selections. As such these and the subsequent numbers offer an early insight about strikers involvement in their teams’ play in the most wide open edition of the Serie A in years. 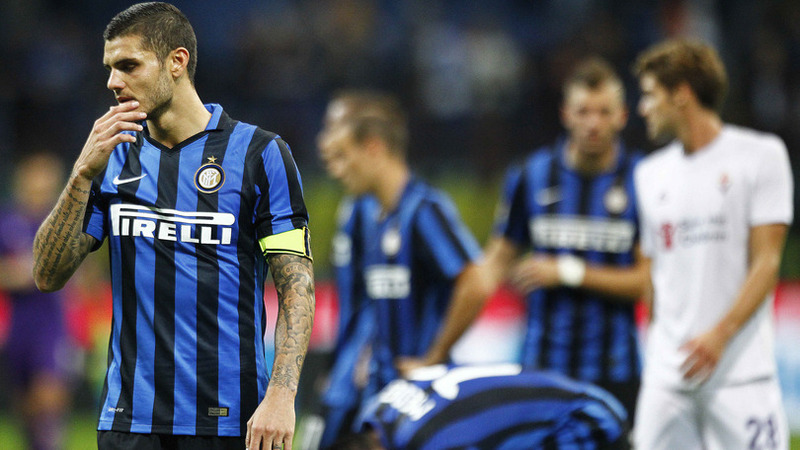 As you can see, Mauro Icardi –highlighted in the image – was right. He receives just 19.1 passes every 90 minutes, approximately 9 passes less than the league average for strikers of 28.1 per 90 minutes. What is even more interesting is the amount of passes that his team-mate Jovetic receives, who so far has started together with Icardi just four times. The ex City player, is the recipient of 43.6 passes per 90, twice the amount of Icardi, and the highest in this sample. Jovetic is a different type of striker, who likes to come deep to get the ball and who often roams a lot providing the necessary links with the rest of the team, while Icardi is more of a poacher (in the modern interpretation of the role), who puts goals above everything else and prefers to stay into the penalty box as much as possible. Yet the outcome confirms the main deficiency of Icardi’s style of play: he is not particularly expert in supporting the team overall, and he spends much time isolated on the pitch when Inter has the ball. I feel he has already partially improved this flaw, but he has still a lot of work to do, and he can’t blame only his team-mates for his lack of passes received. Overall the other only striker who receives at least 40 passes p90 is Paulo Dybala, who has been Juventus best striker so far (0.39 non-penalty goals p90) despite a difficult start of the season for the Bianconeri. Jovetic and Dybala, together with Théréau, Dzeko, Higuaín and Muriel, are the only attackers who receive at least 35 passes every 90 minutes. Curiously, we need to decrease the amount by more than 5 units to find the 7th most involved striker, Atalanta’s Mauricio Pinilla. It’s interesting to check how strikers’ pairs performed in this metric. Empoli’s attacking duo consisting of Manuel Pucciarelli and Massimo Maccarone receive approximately the same exact volume of passes p90: 29.7 for Pucciarelli and 28.9 for Big Mac. Also Meggiorini (30.0) and Paloschi (26.1), the starting forwards in Rolando Maran’s 4-3-1-2, are involved at a very similar rate in Chievo’s plays. The same applies to Torino’s Fabio Quagliarella (22.5) and Maxi López (18.3) although this is an outcome which makes him the least involved strikers of the 28 examined. Bacca and Luiz Adriano are no more a pair, since Mihajlovic has switched from the 4-3-1-2 to the 4-3-3, while Dybala and Mandzukic have played together just three games, so comparisons on these two strikers’ rates are less meaningful. Even if they started together just five times, the difference in passes received between the two Udinese’s strikers is the second biggest among strikers pairs examined: Théréau receives 16.3 passes more than captain Di Natale. Federico Dionisi’s 30.3 passes received p90 are around twelve more than the amount of his team-mate at Frosinone, Daniel Ciofani. Likewise, Luis Muriel is the recipient of 11.2 passes more than his team-mate Edér over the course of 90 minutes. 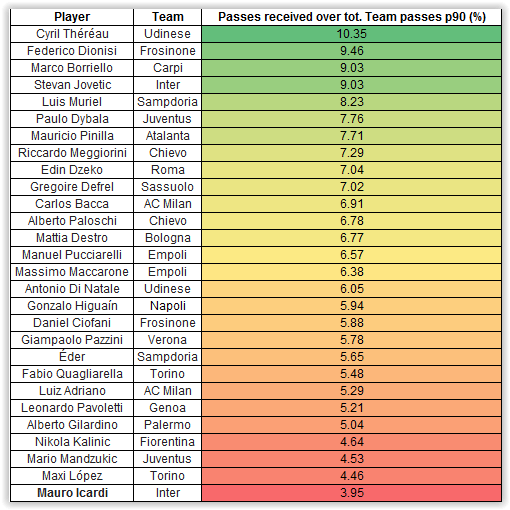 In absolute terms, Icardi is third least in passes received per 90, but every team plays a different amount of passes during a game. What happens if we look at the percentage of passes he receives against the total amount of passes made by Inter every 90 minutes? Things get even worse: with just under 4% of passes received of the total, Icardi is the worst in Serie A.
Cyril Théréau is the most involved in the entire league, receiving more than one pass for each ten passes played by Udinese. Federico Dionisi (9.4%) and Marco Borriello (9.0%) are just behind him. They play for two teams that are relegations candidates and the high percentage of passes received could be explained by the fact that they are both very strong in the air and so they act as the target men for their respective teams, to launch counter attacks or just to ease pressure from their team-mates. We could draw similar conclusion on the improvements in the ranks of Dionisi’s partner Ciofani, and Verona’s Giampaolo Pazzini. After years with Francesco Totti as the false 9, Roma are also exploiting the aerial abilities of Edin Dzeko: Szczesny, the starting goalkeeper this season, is attempting about 30% more long balls than De Sanctis last season (19.9 p90 vs. 15.4 p90). At the same time, the ranks here of strikers like Higuain and Kalinic have decisively diminished since they receive a lot of passes, but it’s also true that their teams are the two which play most passes per game (Napoli – 604.9; Fiorentina – 630.2). So far we have analyzed the volume of passes received by strikers, but essentially they are supposed to score goals so what really matters is not the quantity but the efficiency of those passes, that is the amount of passes that lead to a shot in relation to the total amount of passes received. Speaking of Inter’s two strikers, passes received by Icardi are far more dangerous in terms of chance creation (7.2% of Icardi passes received led to a shot, against just 3.2% of Jovetic’s), but he and Jovetic receive the same amount of passes leading to a shot, 1.4 p90. Without knowing the quality of those chances we can’t say anything more, but ultimately this data confirms what I wrote about the difference between Argentinian and the Montenegrin. Icardi is a rapacious penalty-box striker, while Jovetic is a second striker, whose scope on the pitch is way bigger: on paper a compatible offensive pair. With data about both volume and efficiency of passes received, we can combine those metrics in a graph and divide them in four groups according to averages. The x-axis shows the strikers’ absolute involvement via passes received p90, while the y-axis has the combined amount of assists and key passes received p90; all the shots that were assisted. Colour represents the relative involvement of every striker (the percentage of passes received over total team passes per 90 minutes). Higuaín, Dzeko and Dybala and the strikers in the top-right quadrant have been recipients of a high volume of passes and those passes have often led to a shot. Jovetic and Empoli’s attacking duo of Maccarone and Pucciarelli have been involved a lot in the play of their team, but not much in finishing chances. This makes sense considering that both under Sarri and now Giampaolo, Empoli forwards have the tendency to move wide to open up space for the runs of their team’s main attacking threat, offensive midfielder Riccardo Saponara. 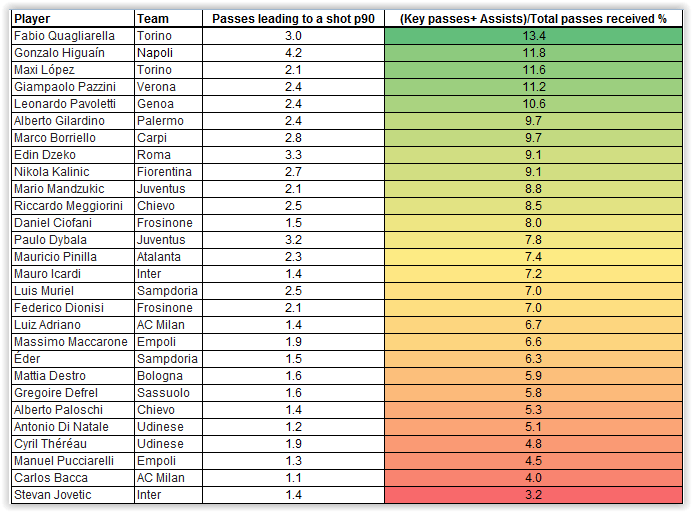 Strikers in the top-left quadrant like Quagliarella, Gilardino, Pazzini and Pavoletti have not been very involved in possession but are a concrete option to finishing their team’s plays. Players in the bottom-left quadrant have not been involved at an high rate and the passes they have received were not necessarily dangerous but so far this hasn’t prevented them from scoring, since Edér is currently Serie A joint top-scorer together with Higuaín (both scored 9 goals), while Bacca has already found the net six times so far. Once again quality wins over quantity. Strikers are often judged by their direct contribution, like goals, assists and shots they make but they constitute the furthest layer of a team, so in their performances is equally important how and how much they are supplied by the rest of their team-mates. How many times have we seen a striker moving to a different team and radically altering his level of performance? With further advanced data, we could examine for example how far from goal a forward is supplied on average or also measure the quality of chances they have thanks to shots based and non-shots based expected goals models. This piece was just a synthetic look at strikers’ involvement but I hope it could represent a decent starting point for another layer in the analysis of a striker’s contribution.